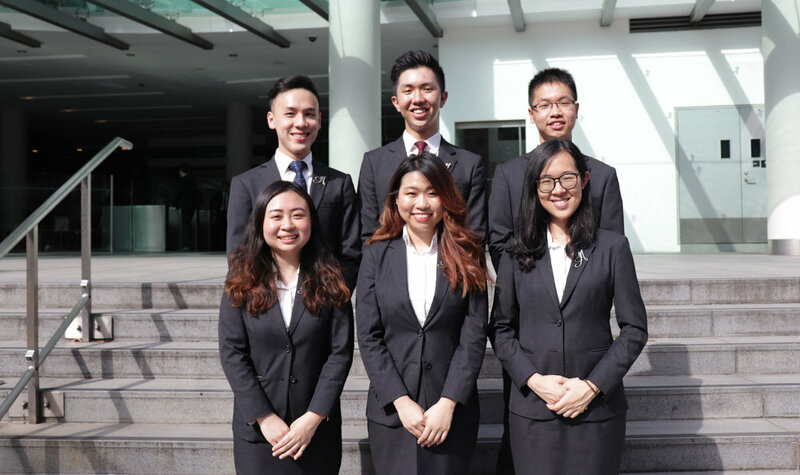 All our Ambassadors have the opportunity to take up leadership positions in ASMU which includes various roles such as an EXCO member, Portfolio Head and Parents' Day Overall In-Charge. ASMU provides our ambassadors a platform to grow and hone leadership skills. "For me, it is a humbling experience to lead the Corps to continually sharpen our value proposition and remain closely aligned with the vision of the university. As we celebrate our fifteenth year, the Corps has evolved from not only being credible advocates, to becoming facilitators of the university’s vision. Stepping up to lead was not an easy decision because I knew it was a journey that would push me to my limits and test my character at every step along the way. But, encouraged by my fellow Ambassadors, I am sure that these challenges will make my journey here in SMU even more rewarding and memorable." -Terence Yeo, 15th Exco. "My ASMU experience has been filled with opportunities to learn and challenge myself to step out of my own comfort zone. I have grown not only as a person and a leader, but also professionally. Having had the opportunity to be the 15th EXCO, and leading a group of outstanding and well-rounded individuals is not something I’ve much exposure to, but this family has helped me grow so much and made me constantly seek to improve myself to become a better version of who I was yesterday. I am thankful for this nurturing and accepting group of people, who have made my ASMU journey nothing short of amazing. I have also benefited greatly from the mentorship system, and I hope that future batches of Ambassadors will continue to benefit from it. I have learnt the importance of resilience and grit when faced with obstacles, and have figured that when life puts you in tough situations, don’t ask 'Why me?' but say 'Try me'." -Kelly Tan, 15th Exco. "It has definitely been a journey of personal and professional development, and a source of invaluable learning. Leading a family of excellent leaders to achieve strategic objectives is definitely challenging, but you will always be surrounded by nurturing staff and supportive peers. The importance of managing people and understanding the interconnectivity between systems become apparent and crucial for success not just within the Corps but after graduation as well." -Kelvin Fan, 14th Exco. "We learn the most when we are out of our comfort zone. My journey in the Corps was a challenging yet fulfilling one. From PD Second OIC to the VP of the Corps, I am always grateful for the nurturing seniors and supportive peers and juniors whom I am blessed with. My biggest takeaway from this experience is effective communication. To be able to justify my opinions, to understand other parties' points of view and to reconcile different perspectives were the vital skills I picked up which remain very relevant and helpful today." -Looi Yin Yee, 14th Exco. "Joining the leadership team of the Corps has been one of the most eventful part of my student life. Beyond just the common hard and soft skills you can expect to learn, have the opportunity to lead, manage and succeed with fellow ambassadors of diverse backgrounds and seniority has been an enriching experience. Like most things that matter, I still periodically look back at the bittersweet moments, when I grew under pressure and good guidance." -Derrick Pang, 14th Exco. "Taking up the role of Exco member was no easy task, but the lessons that came with it were invaluable. In my time in the Exco, I had the opportunity to work with different offices and better understand the changes in SMU. Moreover, it was also an exercise in discipline to balance Exco duties with school and my personal life - although I'm still quite the procrastinator when I put my mind to it." -Heather Humphries, 14th Exco. "Being the Corporate Communications Portfolio Head has been an enriching experience thus far. I have learnt a great deal - from how to identify areas for improvement and strategise solutions to developing my creative side with new initiatives to boost ASMU's social media reach and effectiveness. Being the head also means that I oversee different projects, and this has developed my ability to work with others better and facilitate discussion between teams. I have enjoyed myself greatly!" -Sarsa Kailas, 15th Portfolio Head. "Being the Talent Integration Portfolio Head is a daunting yet rewarding experience. The idea of integrating such a vast group of talents into something cohesive was a tall order, but it also gave me a glimpse into the unique value that lies in each individual ambassador of the Corps. The journey as portfolio head has been made extremely smooth thanks to an extremely capable team that I work with. They are independent and hardworking, just what a successful team needs." -Lee Kai Yang, 15th Portfolio Head. "Despite being the Internal Engagement Portfolio Head for only a short one month, it has been nothing short of enriching. Although it may be challenging at times, it brings about self development and awareness through experiences that I encounter uniquely as the Internal Engagement head. I appreciate and enjoy this opportunity as I get to work closely with like-minded people, to bring about a positive change and joy to the Corps." -Sandra Tan, 15th Portfolio Head. "The start is always the difficult part. Being the Alumni Engagement Portfolio Head requires many face to face interaction with many industry established ASMU alumni, and I realised that initial first impressions are definitely important. However, after the initial difficulties, the alumni are part and parcel of my growth. They teach you things that are vital for the future world. Being mentored by the alumni and leading my team to create avenues of interaction between alumni and current ambassadors is extremely fulfilling." -Tan Junn Wei, 15th Portfolio Head. "To play an active role in advancing the University’s branding, and to mentor my fellow Ambassadors as the Tours Portfolio Head in executing the operations of large scale University events - that, has been a truly humbling experience. Nothing beats witnessing them rise to the occasion of being leaders in their own ways." -Irina Sia, 15th Portfolio Head. "As John F.Kennedy says, 'Leadership and learning are indispensable to each other.' Driven to help the Corps learn and become even better representatives of the institution, I took on the Training and Development Portfolio Head Position. Through my term as a leader, I consistently hone my stakeholder management skills, evaluation skills and ability to effectively present my ideas. I derive joy from seeing others grow, knowing that the trainings were helping and targeted in closing the gaps for them." -Jessica Lee, 15th Portfolio Head. "Ask me a year ago and I would definitely not have imagined myself leading Parents’ Day 2018. The huge responsibility of leading such a large scale event and managing a team of 25 individuals was a very tiring but yet rewarding journey. To be able to see each and every junior ambassador grow through their Parents' Day journey and develop into confident and capable individuals spurred me on even when the journey was difficult. Despite being a part of the Parents' Day team twice, the experience has been vastly different. Leading it this time round, I learnt many more invaluable lessons that I would not have been exposed to before. It has been a pleasant and rewarding journey and I thank my team for working with me through this." -Rebecca Foong, Parents' Day 2018 Overall In-Charge.